This is a project I have been working on with a friend of mine for over two years now that isn't directly OpenMPT-related for once. I thought I'd post about it on this forum as well as surely there are are some owners of the relevant hardware to be found here. We designed memory cards that can serve as a replacement for Roland's legacy memory cards (M-128D, M-256D, M-256E, M-512E, M-512G) as well as Akai's electrically equivalent BR-16 and BR-32 cards. These cards are used by a wide range of vintage Roland and Akai audio gear for storing patch data. The project is nearing completion and you can now sign up to be informed about the availability of the card! Some time after I bought my Roland D-50 a few years ago, I was running out of space for storing my favourite patches on the synth, so I got a Roland M-256 RAM card for 30€ off eBay to extend the synth's memory - which was a real bargain at the time, when they were typically going for 50€ or more. Prices have increased in the meantime and it seems like you cannot find an M-256 memory card for less than 80€ these days. I quickly realized that I would be running out of space again very soon, and getting yet another memory card was out of question - they were expensive, and constantly switching memory cards would be too much of a hassle. Schematics for building custom replacement cards do exist, but they still only offer a single bank of memory and require a battery... What I wanted, was a multi-bank memory card! I talked to a good friend of mine about my idea, and he was instantly captivated by it. 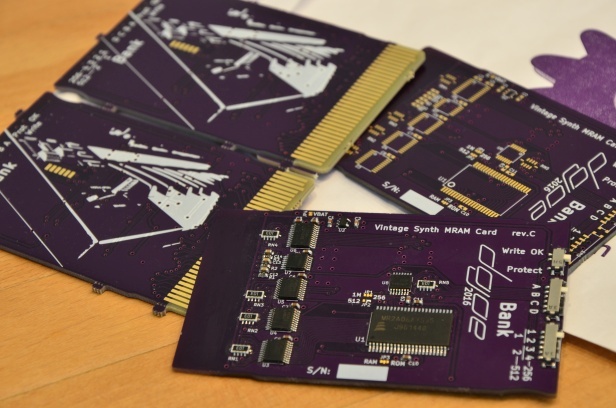 He offered his electrical engineering skills to build a multi-bank memory card based on MRAM, which is a form of non-volatile memory that is electrically compatible with the old SRAM chips used on the original Roland memory cards (different voltage levels notwithstanding). Soon after the design phase started, we posted about this project on Vintage Synth. You will find a lot of interesting information about the development process of the card on that thread which I won't re-iterate here. More than two years later, the project is now slowly nearing completion and the card has been confirmed to work with a variety of Roland devices (small print: there are currently still a few problems with a handful of devices that will most likely be resolved). We are not quite ready yet for taking pre-orders, but we want to inform potential users of the card that they can soon get their hands on it. You can sign up to be informed about the availability of the card and be among the first to pre-order the card! How does the bank switching work? Every card poses either as a M-512 or M-256 / M-128 card. The M-128 / M-256 variant has sixteen banks, while the M-512 variant has eight banks. Banks can be switched by means of a pair of sliders at the rear end of the card, which is typically easily reachable on most supported synths. After changing to another bank, dial up a new patch on your synth and you are ready to go! We do not know yet, but you can be sure that it won't be much more than an original card would cost on eBay - while giving you sixteen times the amount of memory! If you have any questions about the cards, please post them here. Yup, I have been able to access the forum from exactly one IP address since then - neither of my vServers, my home IPs nor my university IPs work. Let's hope the issue gets sorted out soon. I guess we set up the information site just in time, otherwise VSE would still be the only place with information about the memory card project. The cards are now finally ready to order! For everyone who's interested - the cards are back in stock. My uncle actually has some of this vintage gear. I've mailed him about it. He might be interested.